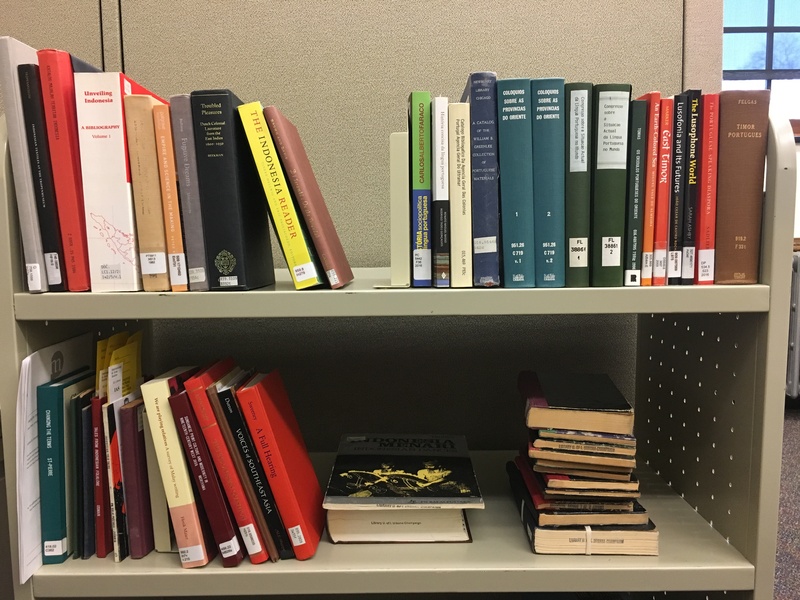 This cart of in the IAS library holds books that GAs Laura and Mariah are using to complete research for their digital projects. Balai Pustaka (BP) is a state-run publisher in Indonesia that provides a unique understanding of print publishing, censorship, language development, and Dutch colonialism in Indonesia. Founded as the Commissie voor de Inlandsche School en Volkslectuur (the Commission for People’s Education and Reading) in 1908 and renamed Balai Pustaka in 1917, BP changed hands in WWII when the Japanese occupied Indonesia, and again in 1949 when Indonesia gained independence from the Dutch. Balai Pustaka publications range from the earliest Indonesian novels in the 1920s to the later textbook and educational materials of the post-colonial period. An online research portal for materials related to Balai Pustaka will be published through the International and Area Studies Library using the Omeka platform. This tool will connect reference sources about BP, sources about Indonesian publishing, and historical context about the Dutch colonial and post-colonial periods with information about Balai Pustaka holdings at the University of Illinois at Urbana-Champaign. 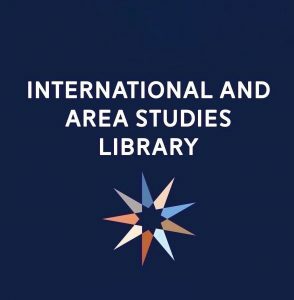 The University Library holds more than 150 titles from this publisher from the post-colonial period (1951-), which can be of great value to researchers studying the political, social, and cultural histories of Indonesia. Timor-Leste is one of the youngest countries in the world, having officially gained independence in 2002. It was a Portuguese colony from the 1510s until Portugal withdrew in 1975. Indonesia invaded the country later that same year and stayed in power until 1999, when the majority of East Timorese voted for independence and the United Nations stepped in to help with the transition. Timor-Leste is home to 1.3 million people, who speak many local languages (Portuguese and Tetum are the official languages, and Indonesian and English are the working languages). Because the country is young, Timor-Leste is still building its national library and archives. A “Research Guide to Timor-Leste (East Timor)” is in production and will join the other library guides by the International and Area Studies Library early in the spring semester. Not a lot of libraries have guides about Timor-Leste, so this tool aims to be really useful for researchers. The research guide will provide a variety of resources related to the country’s history, languages, cultural heritage, and government. The time, date, and location of these presentations will be listed on the IAS calendar in early Spring, at which time these sites will also be published. Any questions can be directed to Laura Rocco or Mariah Schaefer. The International and Area Studies Library has spent the past several months posting news articles, videos, and other resources related to the WWI armistice, which celebrates its 100-year anniversary on Sunday, November 11. The research about WWI is by no means exhaustive, but much information has been gathered over the last 100 years that can shed light on this period of time. Here are some of our favorite UIUC resources we’ve found relating to the end of WWI and the armistice. 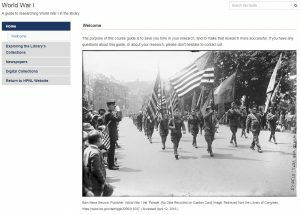 This library guide details UIUC Archives holdings related to WWI, including information about the University’s Student Army Training Corps (SATC) and students who served. Materials can be searched for in the Archives Database. This library guide provides information about and links for searching library print collections, newspaper databases, and other digital collections for WWI research. In 2015, SourceLab published a digital edition of a film showing the work of Anna Coleman Ladd, an American sculptor who made facial prosthetics for World War I veterans. SourceLab is a group of UIUC faculty and students who create digital editions of historical materials. Learn more here. This post describes how WWI and the rampant spread of Influenza affected the UIUC campus in 1918. This story includes several photographs and documents from the University Archives. This list highlights just a few of the great resources at UIUC for the study of WWI! For more information about researching WWI, contact the Global Studies Librarian, Lynne Rudasill, rudasill@illinois.edu,or visit the Center for Global Studies. Since 2010, the United Nations celebrates World Statistics Day every five years on October 20. The last World Statistics Day’s theme was Better Data, Better Lives, which emphasized “the critical role of high-quality official statistical information in analysis and informed policy decision-making in support of sustainable development.” Below we have gathered some links to global statistical resources that could be useful to patrons. United Nations: The United Nations Statistics Division makes available global data related to development, the economy, the environment, population, and more. Its publications include the Statistical Yearbook, the World Statistics Pocketbook, and the Monthly Bulletin of Statistics. UNESCO: The UNESCO Institute of Statistics has a dedicated website for its Data for the Sustainable Development Goals, which covers education and literacy; science, technology, and innovation; culture; and communication and information. WHO: The World Health Organization’s Global Health Observatory has a variety of health statistics on all countries that are members of the organization. It also has data visualizations about several statistical topics. World Bank: The World Bank provides data that can be searched by country or by indicators like agriculture and rural development, aid effectiveness, climate change, economy and growth, education, energy and mining, environment, external debt, financial sector, gender, health, infrastructure, poverty, private sector, public sector, science and technology, social development, social protection and labor, trade, and urban development. Eurostat: The European Union’s statistical office positions itself as “your key to European statistics” and makes news, data, and publications available on its website. U.S. Census Bureau: The United States Census Bureau has compiled a good list of international statistical agencies (in alphabetical order by country) as well as other statistical resources related to censuses, survey activities, and global health resources. How Far Should the Library Promote Peaceful and Inclusive Societies for Sustainable Development? Last week’s Glocal Notes post featured the coming centenary of the armistice that ended the First World War by telling the story of the destruction and construction of the KU Leuven Library. 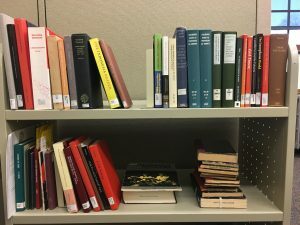 The Leuven library speaks to the efforts of the library profession to collectively donate books towards efforts to replace what was so tragically lost during the war. Books and libraries played other roles in the war, and librarians served both on the battlefield and in prominent roles aimed at getting collections of books to soldiers. This begs the question of what librarians were doing to promote the cause for peace before the “Great War”? 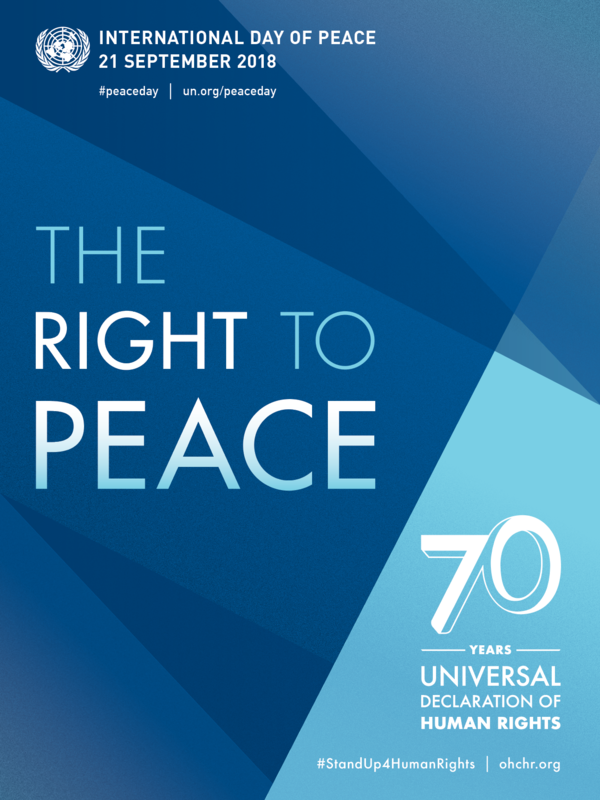 The UN International Day of Peace on September 21st provides an opportunity to reflect on efforts of librarians and bibliographers to promote peace and work towards ideals that promoted what the UN Declaration of Human Rights now calls the “inherent dignity and equal and inalienable rights of all members of the human race” – an idea that to this day remains elusive to both implement socially and instill in the consciousness of people. “we must oppose facts which are in contradiction with [peace], but especially create institutions which will be the denial of the pretended anarchy existing between the peoples” (1911, p. 1). “become conscious of the immanent force which is at their disposal. 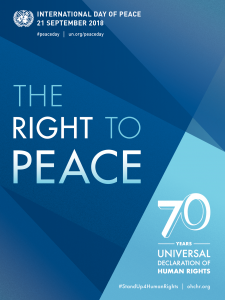 This force we call internationalism: it is the strongest cause of peace” (p. 2). Librarians in the US were working towards similar ends, though often focused on using the public library as a vehicle for social change. Many urban public libraries were active in promoting peace studies and literature through their collections and engaging in what many contemporary librarians may consider Radical Cataloging. For example, in 1908, the Brooklyn Public Library published a 57-page list of books on peace and internationalism, and libraries in Denver, Boston, and Buffalo soon followed suit (Bowerman, 1915). By 1911, George F. Bowerman, Director of the Public Library of the District of Columbia, proposed the use of public, college, and school libraries to further international peace through the collection of books on peace and global affairs (Scott, 1911). The International Association of International Conciliation went so far as to insert cards promoting books and periodicals on the peace movement into the catalogs of American Libraries. In 1912, the New York Library Club held a meeting on the topic of “The Relations of Libraries to the Peace Movement” (Quieted Germany, 1912, p. 9). Paul Brockett, of the Smithsonian Institution Library, “told of some ways in which librarians and teachers might co-operate to encourage the spread and accessibility of peace literature” (p. 9). The question of the profession’s role in advocating peace continued after the war began in Europe. At the 1915 American Library Association Annual Conference in Berkeley, California, George Bowerman gave a paper titled How Far Should the Library Aid the Peace Movement and Similar Propoganda? Bowerman asked his colleagues what they could do to bring about “peace that shall last” and whether there were “special considerations that may properly affect our attitude towards the peace movement” (Bowerman, 1915, p. 129). Bowerman, G. (1915). How far should the library aid the peace movement and similar propaganda? Bulletin of the American Library Association, 9(4), 129-133. La Fontaine, H. (1911). Salus Mundi Suprima Lex. Carnegie Endowment for International Peace. New York and Washington Offices. (n.d.). Carnegie Endowment for International Peace. New York and Washington Offices Records, 1910-1954., Volume 35(4078585). Carnegie Endowment for International Peace Archives, Columbia University Libraries. Quieted Germany. (1912). New York Times, p. 9. Scott, J. B. (1911, November 6). Letter from J. B. Scott to N. Butler. Carnegie Endowment for International Peace. New York and Washington Offices. Carnegie Endowment for International Peace. New York and Washington Offices Records, 1910-1954., Volume 78(4078585). Carnegie Endowment for International Peace Archives, Columbia University Libraries.